Is Blogging really an Industry? Is blogging an Industry? Apparently, so. 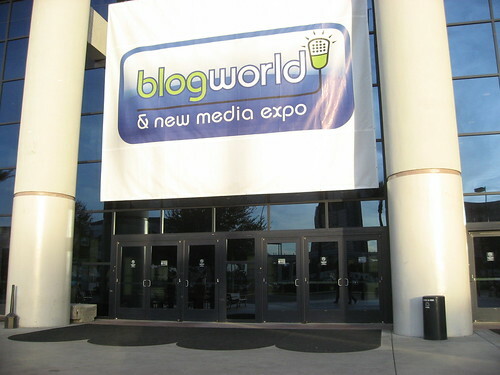 Nearly 1700 attendees showed up at Day 1 of 2 in Las Vegas for the first Blog World Expo. There are nearly 100 speakers each day, with 10 tracks for this massive conference. A few taxi drivers asked me what the conference was about, I told them it was an “internet” conference, which they said seemed to be very popular lately. They asked what I did, and I told them the honest truth, “I’m a writer”. How do you know it’s a real industry? There are buyers and sellers, advertisers and content creators, celebrities, personalities, press, media, analysts (like me) and even booth babes. What’s one big clue to me that it’s an industry? There were a lot of political, government and even military folks that attended, it’s not just for geeks. Where does this take us, where will we go? In previous conversations with Chris Heuer, we’ve speculated we’re really in year 2 out of a 10 year business growth curve for the social media industry before it completely normalizes out of a growth curve. I was glad to finally see a physical print copy of Website Magazine, I was one of the contributes, see articles in back “Social Media Strategy: From Drawing room to Board Room” Last night there was an industry “pajama” party at the Hard Rock Cafe, drinks, food, chocolate fountain and live performances really made it a must-attend. I went to bed early as I had a 5:30 concall this morning, which I just finished. Dedication is hard. Although I arrived mid-afternoon I was able to catch Maggie Fox’s case study on Yamaha’s social media blogging program, a good deployment starting with business needs followed up by metrics, she took a strategic approach. I cruised all the vendor booths and spent time with several very interesting companies. Today, I’ll be speaking on stage with Chris Brogan (who applies stillness and listening), along the same lines: “Delivering a cohesive social media strategy”, more updates soon. Update: I met up with Debbie Weil, who I had spoken with on a panel about two years ago, we’ve stayed on each others radar ever since. She video interviewed me, check it out!